Mortgage and Real Estate News and Tips: Mortgage Bond Market Analysis - College Football Championship edition, eh hem, Monday Morning No Economic Data edition. Mortgage Bond Market Analysis - College Football Championship edition, eh hem, Monday Morning No Economic Data edition. Happy Monday and YES, the day is finally here. Today is the day of the first college football national championship game under the new 4 team playoff format. Tonight at 5:30 PST we will see what amounts to college football's version of the Superbowl when Oregon and Ohio State play each other in the inaugural National Championship Game . But I digress. I doubt this is having any impact on the benchmark bonds or the stock market but Nike is the sponsor for both Oregon and OSU (Nike is a huge funder of Oregon athletics since they are right in Oregon's back yard - Phil Knight is a big-time booster) and may see some increased sales with a resulting tick up in their stock. Who knows? The FNMA benchmark bond is 22 basis points off its low and 11 basis points off its high. The RSI (Relative Strength Indicator) is above the overbought threshold which means that traders may decide it's time to sell and take some profits. The price is 2 basis points below the 2nd level of resistance and 37 basis points above the 1st level of resistance which is currently more of a support level and means it's easier to go down than up at this point. 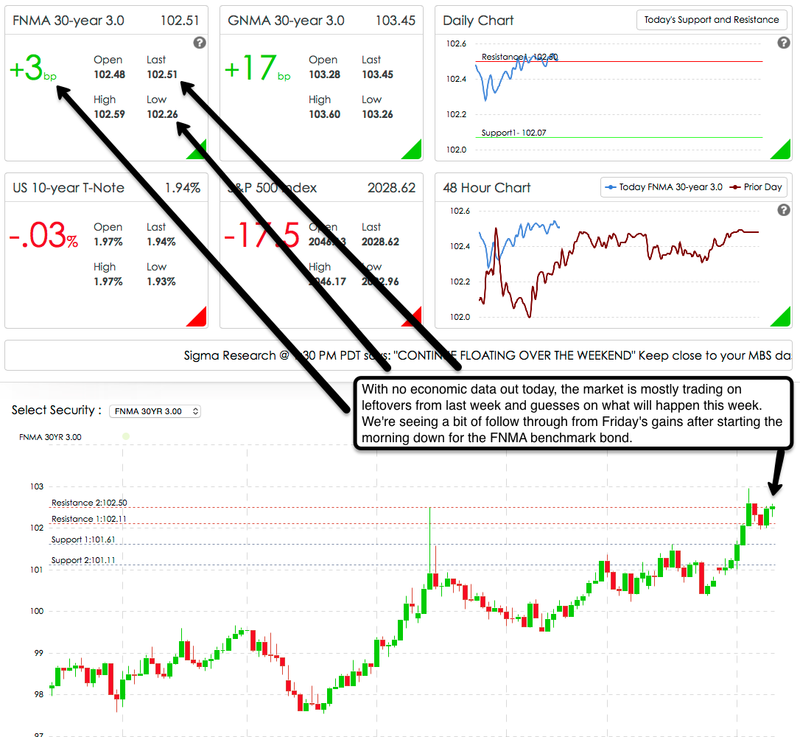 That said, weakness in the price of oil along with other misses on data points last week may keep investors engaged. What's up on the economic data calendar? Tomorrow is another very light day for data with the NFIB Business Optimism Index and the IBD/TIPP Optimism Index (a consumer measure). Wednesday and Thursday will bring some data points with a bit more substance. For now, I'd float with caution on any loan closing 15-30 days out and I would lock for loans closing in 15 days or less. Please contact me (702-812-1214) if I can help with anything mortgage related. In the meantime, make today great.